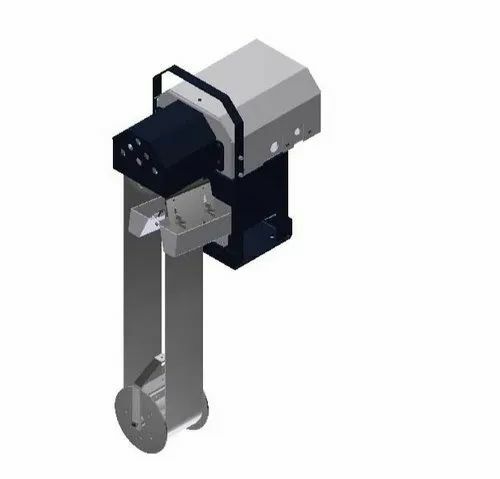 The Belt Type Oil Skimmer utilizes a continuous belt and wiper to remove up to 40 gallons of oil per hour from the fluid surface. The belt, operating on a motor and pulley system, runs through contaminated liquid to pick up oil from the surface. After traveling over the head pulley, the belt passes through tandem wiper blades where oil is scraped off both sides of the belt and discharged. The tail pulley has flanges which allow it to roll freely on the inside of the belt without becoming dislodged. It requires no bearings and does not need to be fastened to the tank. If turbulent conditions exist, an optional tether and cage assembly prevents the tail pulley from being dislodged. Oil skimming makes use of the differences in specific gravity and surface tension between oil and water. These physical characteristics allow the belt to attract oil and other hydrocarbon liquids from the surface of the fluid. The Model 8 can be used in tanks with depths as shallow as one foot, or as deep as 100 feet. Our Presence in the industry from 2 decades has enabled us to produce the best quality Water and Waste Water Management System for our buyers. Our mother entity named M/S Hydro Treat Technologies was established in year 1994. Established in 2012 with the name of "Shiva Global Environmental Pvt Ltd"(Formerly known as BDS Hydro Treat Consultants Private Limited). Our high-tech infrastructure coupled with team of qualified professionals enables us to fulfill the varied expectations of our valued client. Since inception, we are engaged in design, manufacturing, consultancy, exporting, supplying & service providing of premium quality Water and Waste Water Treatment Plants, Chemicals & Spares. In our range, we offer Total Water Management Products Such as Water Treatment Plants, Waste Water Treatment Plants, Effluent Treatment Plants, Sewage Treatment Plants, Membrane Filtration System and Waste Water Recycling Systems based on Zero Liquid Discharge Technology. We are the leading exporter in Indian Subcontinent. With these aspects we are exporting our assortment to clients from America, Indian Subcontinent.